For this new giveaway, we will be picking three winners. The first prizewinner drawn will receive their choice of Photoshop, Illustrator, or InDesign CS6. Then the second winner will get their choice of the two products remaining, and finally the third winner will receive the final package. Note these are not upgrade or education versions – these are the shrink­wrapped, full commercial English releases of CS6. Photoshop, Illustrator, and InDesign currently sell for $699, $599, and $699 respectively in the USA, though this contest is open internationally as well! These products are getting rave reviews from customers but if you haven’t tried them out for yourself yet, then you can easily just download the free trials (for either Windows and Mac) to get started right away. All fourteen CS6 tools (and much more) are also available through a free tryout of the Creative Cloud. That’s it! Each of these actions counts as a single entry into the drawing – so if you do all four, you would receive 4 different chances to win these Creative Suite 6 tools. Be sure your email is correct so that we can contact you. One entry per reader for each method, but please do share and tell your friends and colleagues who would like the software as well. Submissions are open until 11:59pm EDT on Monday, February 11th, 2013. The winners will be drawn at random from all valid entries, and contacted via email – and we’ll announce the lucky recipients (first names only) right here the following week. If you’re one of them, we’ll ship you a shiny new box of CS6 completely free! I would prefer Illustrator in order to use it for book illustrations that I’m working on. I would be so happy to win Illustrator! I want to go back to school for graphic design and would love to get a head start! Photoshop definitely, and my photos will be grateful. Using Illustrator and Photoshop since earlier version on Mac. currently using Adobe Master Collection CS3 with Windows 7. Using Illustrator for graphics designing. Photoshop! I’m a guy who has big dreams but a little wallet! Learned Creative Suite at my last job. Would love to edit on my personal laptop! I have CS2 creative suite. Would love to Photoshop or Illustrator or the Creative Suite. Our lucky readers drawn are Martin Hunte from Toronto, Canada, Kuzey Atici from Melbourne, Australia, and Angel from Orlando, Florida! 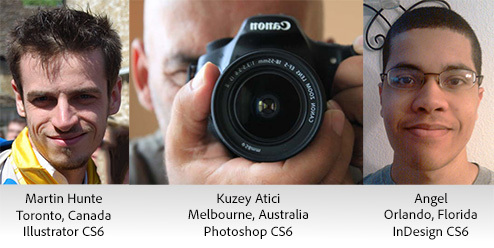 A big congratulations to all three, who will receive brand new copies of Illustrator CS6, Photoshop CS6, and InDesign CS6. I would love the chance to win InDesign because as a communications student I cannot afford it but love the software and need the practice for my résumé and hopefully eventually my career! I would love to have a copy of photoshop — for taking photos of and editing the products I sell on etsy and eBay. Wow, it is not easy to choose between these 3 great products! My practical mind tells me InDesign, but my heart says Illustrator. So it will have to be Illustrator… I can not wait to see what level Adobe has taken it to this launch. I would prefer Photoshop, since I have developed an interest in photography recently. A copy of Photoshop would be great in compensating my lack of photography skill. I would really like to have the Photoshop or Lightroom package cause I would really like to take my photography to the next level, but I am still a college student managing a budget. Hi Andrea, thanks for your comment. If you want the latest versions of both PS + LR (Photoshop CC plus Lightroom 5), then some customers may now be able to get them both for $9.99 a month. I will create premium designs and sell them online to support my income, as Photoshop, illustrator are so expensive to me because of the currency conversion rate! I would love to get the full version of Adobe Illustrator because I have used it in the past for logo design and it has been absolutely amazing. Unfortunately, it was much too expensive for my budget. Thanks for the great giveaway opportunity! Many many thanks for this Great initiative and for conducting this Fabulous Giveaway. It is really appreciated. I would like to get the full version License of Adobe Photoshop CC, the latest version because it has many cool features for designing any types of banners, logos, creative items, and many more which is absolutely marvelous. I would like to create many website logos, creative designs for Genuine websites, creative banners for my projects, and likely use it as a first preference for designing and editing if I win. It would be a Great Help for me for my projects. I wish to be a Lucky winner of this Giveaway this year! I am from a rural area of North Carolina and am trying to work up the money to attend a university to learn animation. I have used Gimp (an open source alternative to Photoshop) for years now and still have trouble with the often counter-intuitive design GUI. I am hoping to win a copy of at least Photoshop because of its user friendly interface and the plethora of training videos on the internet to help me lean how to bring the images in my mind to fruition. Learn Photoshop CC with Complete 13-Hour Training Course – Free!